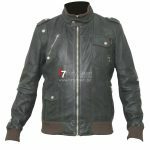 100% sheep SKIN,100% check cotton lining,MODEL 6FT 2”,MODEL WEARING MEDIUM,TRUE TO BADY,SPECIALIST LEATHER DRY CLEAN. 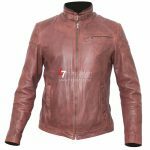 This leather bomber jacket is made using true soft Italian sheep skin which has been put through a wash and deep wax to create a classic bomber look. Featuring ; a double layered ribbed collar with stud fastening and shoulder epaulettes. It has a front body metal zip fastening and four front pockets zipped and studs. The ribbed has been used for waist and cuffs.